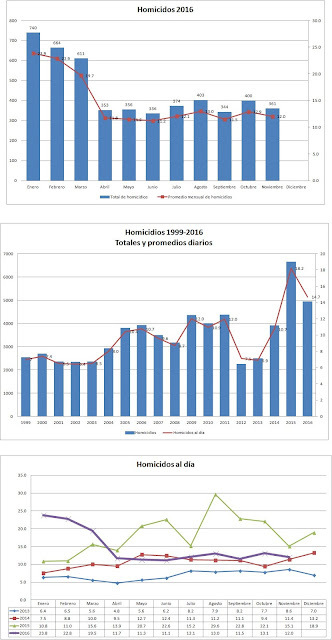 According to statistics from El Salvador's attorney general (FGR) and published in La Prensa Grafica, the number of massacres is increasing and more than 40% are committed by groups other than the gangs. From January 2014 through October 2016, there were 277 massacres in El Salvador, defined as multiple homicide events in which more than three persons were killed. Of those massacres, the attorney general's office says that 157 (57%) were committed by the gangs and 120 (43%) were committed by vigilante groups known as "groups of social cleansing," by killers for hire, and by narco-traffickers. The massacres in total claimed 1011 victims. These FGR statistics contrast with statements from the National Civilian Police, who have always contended that the vast majority of murders in the country are committed by the gangs. 58% of the victims were identified as gang members, while the remainder did not have an identified gang nexus. Make it stop! That’s the message delivered this week by an organization of Protestant churches in El Salvador, Central America’s smallest but deadliest country. The group, known as the Pastoral Initiative for Life and Peace, or IPAZ, is hoping that for the week between Christmas and New Year, gang members, security forces, operatives of so-called death squads and others responsible for the nation’s horrific homicide numbers will accept a temporary “peace pact.” “This time of year lends itself to concrete gestures of peace. This may not be an open war. But the violence is killing us,” IPAZ declared in a statement released Tuesday. El Salvador's government yesterday increased the minimum wage for the country's workers. The increase in minimum wages ranges from a 20% increase in service and industry jobs to more than a 100% increase for certain agricultural jobs. Wages in the countryside for those working in the fields with coffee, sugar cane, cotton, and other crops will range from $200 to $224 monthly. Wages in services, industry and factories will be $300 with a slightly lower wage of $295 for workers in textile and sewing maquila factories. The government says that these sizable increases will benefit more than 235,000 workers in the county. In a recent article titled Deportation Profits, Hilary Goodfriend advances the argument that the growth of the call center industry in El Salvador is the product of powerful forces of big capital in conjunction with US government policies. The policies generate the mass deportation of Salvadorans from the US, many of whom have English language skills. Call centers have taken advantage of this pool of labor in El Salvador, in an industry which has exploded over the past decade. Almost 14,000 Salvadorans made up of families with children as well as unaccompanied children were detained at the US border with Mexico during October and November. This is according to statistics from the US Customs and Border Protection. And those are the rates under the current Obama administration. The odds will be even slimmer after Donald Trump is in office. The white and blue Justice of the Peace offices sit at the corner of the central plaza in Meanguera, El Salvador. From this humble office, Judge Mario Diaz Soto and his small team of assistants are presiding over one of the open legal proceedings involving perhaps the largest massacre of unarmed civilians in the Western Hemisphere, the 1981 El Mozote massacre. That massacre took place 35 years ago today, from December 10-12, 1981. Judge Soto presides over legal proceedings directing exhumations to locate and identify the bodies of additional victims of the massacre at El Mozote and surrounding communities. The legal case before Judge Soto began with a petition from Tutela Legal, the human rights office of the Catholic church, working on behalf of victims’ families, and concerned with the lack of progress and the manner in which previous investigations had been proceeding. November 2016 closed with 361 murders across El Salvador, or an average of 12 per day. It is a high number, but it is 9.7% less than October 2016 and 20.3% less than November 2015. So far this year, El Salvador has seen an 18.6% reduction in the annual level of homicides. Those numbers are an improvement from the horrendous homicide totals in 2015, but will still leave 2016 with the second highest homicide rate in recent years. (Source: LPG Datos).